The success or failure of a resort hinges directly on the working relationship that the board of directors maintains with its resort manager. That relationship must at all times remain respectful of each other’s positions. All board members, particularly the president/chairperson, should always have a clear and concise voice when discussing goals of the resort and expectations of the board with their general manager. The manager should be present at all board meetings, unless an employment issue concerning the manager is being discussed. The manager also should be an active participant in all committee meetings. This will achieve a clear and complete understanding of the goals that the board of directors has set and allow input from the one person who is at the resort daily. 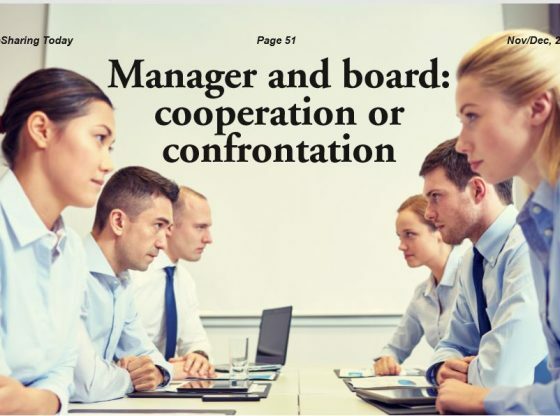 To achieve successful implementation of the board’s goals and maintain the fiduciary responsibility of the board, total cooperation of the manager is needed. The clarity of the financial policies (if any are in writing), the by-laws, the original governing documents, and any other policies and procedures that the board and association have adopted is imperative for uniform compliance by both the manager and board. This clarity of purpose and guidelines will reduce confusion by either team. For example, do these documents spell out in detail the check amount limits; contract commitments; and state and federal permits, forms, and filings that the manager is permitted to sign/authorize? Does the chairperson, treasurer, or clerk need to co-sign above a defined limit? Another area requiring clarity is reporting expectations. To whom and in what detail is the manager reporting on a weekly, monthly, and quarterly basis? Naturally, the president/chairperson would be included in all reporting, but the treasurer and committee chairs also should be included in pertinent reports. Establish a list of reports to be sent monthly to the full board. The list should include financials indicating performance to date versus the previous year, and versus the budget. The manager is responsible for sending these reports promptly to the board. Any concerns should be discussed by the board, and then communicated to the manager by the treasurer with instructions on how to proceed if any action is warranted. The manager’s daily priorities should be guest relations, staffing needs, problem solving, and budget control. To achieve the best possible outcome, outside professional assistance such as attorneys, accountants, and consultants may be needed at times. Within budget constraints, the manager should have a clear path to engage these professionals when needed with the approval of a board member. The manager should work with the board to accomplish all of established goals. Of equal importance, the board should remember that they hired a professional to manage their resort, and they should not hover or micromanage the business. This will diminish both parties’ abilities to succeed at achieving the ultimate goal: a successful property. James Bento is a 30-year veteran of the timeshare industry, most recently as general manager at a legacy resort. He also has worked as a multi-store human resources manager, overseeing up to 60 locations for a large retailing firm.